Newsflash: This ham and pineapple burger is going to settle the pineapple pizza debate once and for all. So quick, so easy, so yum – #teamabsolutelynot. You’re crossing over to the dark side. Fo’ shizz! The main thing you need to know about this recipe. D.E.L.I.C.I.O.U.S!!! The sweet taste of pineapple dripping with melted cheese on top of a thick juicy piece of ham. Tropical heaven. In a roll. Trust me. The next best thing about this recipe. Easy AND done in 20 minutes – 15 if you’re a kitchen ninja. And you won’t get any complaints about this meal. I mean pizza, in a burger. If you don’t want that kind of deliciousness for dinner, who even are you? I’d love to know. Are you #teampineapple or #teamabsolutelynot? 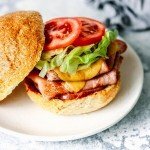 And if you give my ham and pineapple burger a go, leave me a comment. It’s awesome. Ammaright? If you’re not already #teampineapple, get ready. 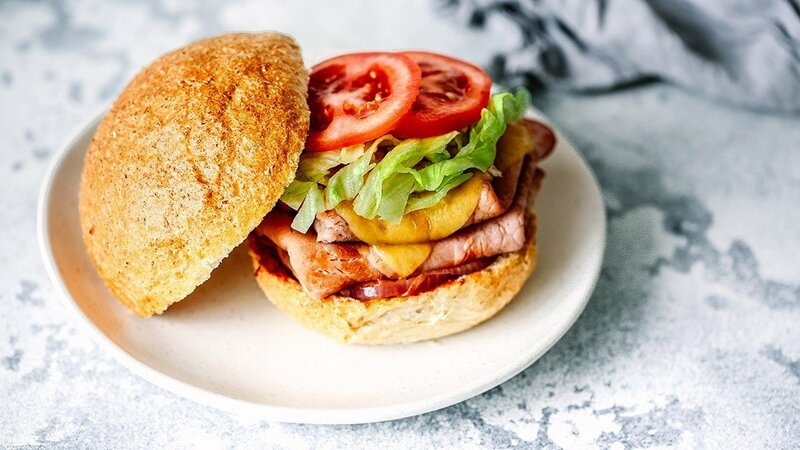 This Ham & Pineapple Pizza Burger is so delicious it will change your mind about pineapple on pizza. Forever! Preheat your oven grill or broiler on high. Heat 2 tsp olive oil in a frying pan over medium to high heat. Meanwhile, thinly slice the onion. Transfer the onion to the frying pan and cook for 5 minutes or until the soft. Remove the onion from the pan and set aside. Next add the ham to the frying pan. Cook for a couple of minutes each side until slightly browned. 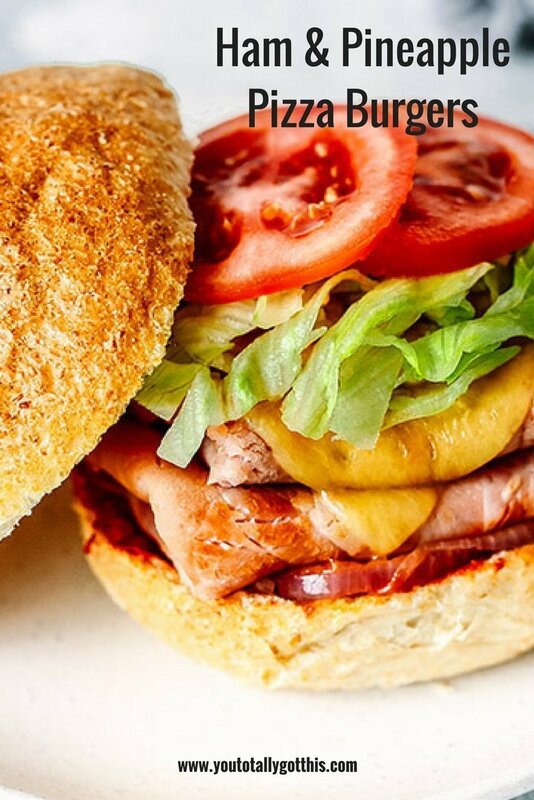 While the ham is cooking, thinly slice the tomato and lettuce. Slice your rolls in half and spread the bottom half with tomato paste or sauce. Next, top with onion, ham, pineapple and cheese and transfer to the oven. Leave under the grill for a few minutes or until the cheese has melted. When you remove the burgers from the oven, top with lettuce and tomato and finish by placing the other half of each roll on top. You will probably have some leftover pineapple after making this recipe. Don’t let it go to waste. The team at Taste has a great collection of pineapple recipes…rum pineapple with coconut and mint anyone? 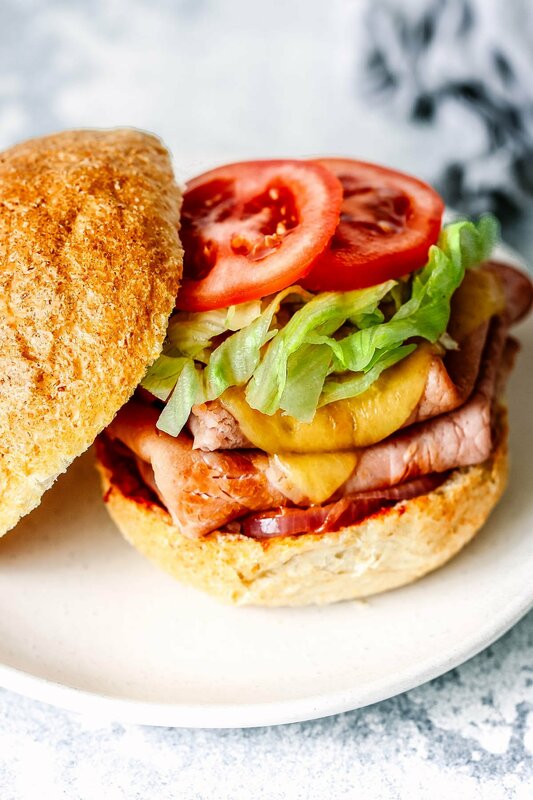 P.S – Want a whole weeks worth of dinners just like this awesome Ham & Pineapple Pizza Burger? Grab your FREE quick and easy weeknight dinner plan right here.